Andhra Pradesh saw 55 percent voter turnout till 3 pm, ANI reported. A YSRCP worker has been taken to a hospital after he was injured in a clash which broke out between YSRCP and TDP workers at a polling station in Jammalamadugu Mandal of Kadapa district, ANI reported. The family of late Nandyal MLA Bhuma Nagi Reddy has accused YSRCP leaders in Allagadda constituency of kidnapping their supporters. Bhuma Mounika (sister of state tourism minister Bhuma Akhila Priya) and Jagath Vikyath Reddy (brother of Akhila Priya) claimed they would protest in front of the YSRCP leader’s house if their supporters aren't returned. Bhuma Mounika also accused YSRCP workers of destroying her car by throwing stones. JD(U) vice-president Prashant Kishor accused Andhra Pradesh chief minister Chandrababu Naidu of spreading fake news, News18 reported. Kishor added that the voters have decided to come out against Naidu. TDP, YSRCP workers clash at polling station in Srinivasapuram village of Gurajala Assembly constituency in Guntur, ANI reported. A video has surfaced which allegedly shows TDP leaders distributing money in Gudivada Assembly seat in Krishna district of Andhra Pradesh. In the video, TDP leaders are purportedly asking voters to vote for TDP, and threatening them that if they don’t, their names would be deleted from the voter rolls and they would be disallowed from seeking benefits under welfare schemes. Below is the video released by TDP. The Andhra Pradesh Assembly elections are being held simultaneously with the first phase of the Lok Sabha polls. Voting will be held for as many as 91 Lok Sabha constituencies and four Assembly elections till 6 pm, besides those that fall in Maoist-hit areas. Speaker of the Andhra Pradesh Legislative Assembly Kodela Sivaprasad Rao was allegedly attacked by YSRCP workers in Guntur district’s Inumella village in Sattenapalle Assembly constituency. He was there to inspect a booth. Rao is contesting from the Narasaraopet Assembly seat. Clashes have been reported from the districts of Guntur and Nellore. The YSRCP candidate from Chandragiri constituency reportedly hurled expletives at voters for not voting for him, according to News18. TDP-YSRCP workers also clashed in Puthalapattu constituency’s Bandarlapalli area in Andhra Pradesh. The police had to lathi-charge the mob, The Quint reported. TDP leader Bhaskar Reddy and YSRCP worker Pulla Reddy died in clashes between party cadre at the polling station in Veerapuram village in Tadipatri Assembly constituency, Anantapur district. Two other party workers are believed to be in a critical condition. Sporadic incidents of violence between workers of rival parties continue to be reported across Andhra Pradesh, with casualties on both sides. YSRCP workers allegedly attacked Speaker of the Andhra Pradesh Assembly Kodela Siva Prasada Rao, who had gone to inspect a polling booth in Guntur’s Inumella village in Sattenapalle Assembly constituency. In the same district, YSRCP candidate G Srinivas Reddy from Narasaraopet Assembly constituency (pictured below) was injured after his car was allegedly attacked by TDP workers in Yallamanda village. YSR Congress Party’s YV Subba Reddy said Chief Minister Chandrababu Naidu's was using "EVM malfunctioning" as an excusing. "He is claiming that when voters are pressing the 'cycle', the vote is going to the 'fan'. He is pre-empting his own defeat. This shows that he has lost hope in this election," he said. "Some news channels are reporting that 30 percent of the EVMs are not working, which is not correct. In total, we have 45,959 booths, and we are using around 92,000 EVMs. We got 344 issues and 25 are still pending," said Andhra Pradesh CEO Gopalakrishna Dwivedi said. Kurnool constituency falls in one of Andhra Pradesh's Maoist-affected districts. The contest here is between BJP's Dr PV Parthasarthi, Congress’ Ahmed Ali Khan, CPM K Prabhakara Reddy, YSR Congress Party's Sanjeev Kumar and TDP’s Kotla Surya Prakash Reddy. Chief Minister N Chandrababu Naidu has written to the Chief Electoral Officer, saying 30 percent of the EVMs were not functioning till 10 am, according to the reports he had received. Demanding re-polling, he claimed that in some polling stations, votes for TDP were being recorded for YSR Congress, Hindustan Times reported. "It is likely that many voters who returned home without voting may not come back even if polling is resumed after replacement/repair of the existing EVMs.Therefore, repolling is needed at all polling stations where voting had not commence till 9.30 am," Naidu wrote. Two polling agents were taken into custody for allegedly offering voters money at Vemavaram village in Prakasam district's Ballikuruva mandal, The Hindu reported. In Kadapa district, YSRCP workers damanged EVMs at booth no. 126 at a polling station in Jandlavaram village of Mydukur mandal. The police have driven the mob away and temporarily locked the polling booth, according to the report. Clashes between TDP and YSRCP party workers are being reported from various places of Andhra Pradesh. Polling equipment was destroyed in Srinivasapuram village in Guntur's Gurazala mandal in one such case of violence. In another brawl in Gudemcheruvu village in Jammalamadugu (Kadapa district), a YSR Congress worker was injured. In a stone-pelting incident between the opposing party workers in Ponnathota of the same mandal, a few people were injured. Similar news is coming in from Mydukur constituency. The Andhra Pradesh chief minister has demanded repolling at the locations where EVMs did not work. He said 30 percent of the voting machines had malfunctioned, because of which polling started nearly three hours late at many places. Jana Sena chief Pawan Kalyan defended his party leader ​Madhusudan Gupta, who was arrested for damaging a voting machine in Gutti in Guntakal Assembly constituency. "How do we know who broke the machine?" he said, according to India Today, even though there's a video of Gupta throwing an EVM on the floor at the polling booth. 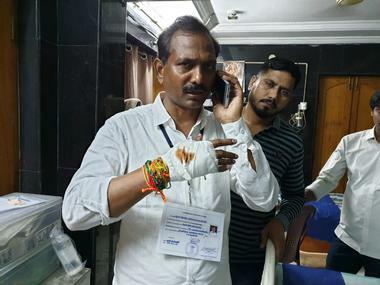 YSR Congress leader Matta Raju was attacked allegedly by TDP workers outside a polling station at Indira Colony High School in Eluru Assembly constituency in West Godavari district, The Times of India reported. In a statement, the YSR Congress claimed its party leaders in Icchapuram are being forced into jails by the police in collusion with the TDP. "Booth numbers 41, 42 and 43 in Rajahmundhry rural constituency have been forcibly occupied by TDP cadre, and they are not allowing voters to exercise their franchise freely," the statement reads, according to The Indian Express. Ironically, Andhra Pradesh Chief Electoral Officer Gopala Krishna Dwivedi was unable to cast his vote at Tadepalli Assembly constituency in Guntur district due to malfunctioning EVMs. Reports are coming in that people are leaving polling booths without voting returning home. TDP candidate Aravinda Babu was attacked allegedly by YSR Congress activists in Narsaraopet Assembly constituency, The Hindu reported. The police had to lathicharge workers of both parties to quell the clashes. Several booths in Kuppam Assembly constituency reported malfunctioning EVMs. Kuppam is Chief Minister Chandrababu Naidu’s seat in Chittoor district. At the 163rd booth in Kadapa city, the button representing the 'fan' symbol did not respond, The Hindu reported. In the 106th booth in Mydukur also, the 'cycle' symbol was unresponsive. Polling booth officers changed the EVMs immediately on complaints. Voting has been delayed in a number of polling booths in Andhra Pradesh due to malfunctioning EVMs, forcing people to wait in queues, braving sultry weather. In the wake of reports of faulty EVMs, Chandrababu Naidu has reiterated his demand to have the voting machines with paper ballots. Jana Sena Party leader Madhusudan Gupta, who has been arrested for damaging a voting machine, threw the EVM on the floor at a polling station in Gutti in Guntakal Assembly constituency of Anantapur district, the police said, according to News18. Gupta was angry with the polling staff for not displaying the names of the Assembly and parliamentary constituencies properly. 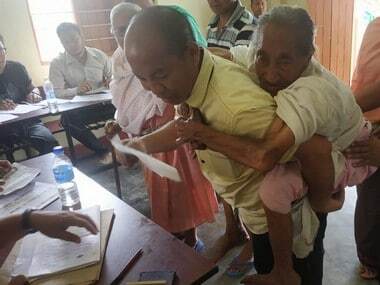 The police said he had lifted the EVM and thrown it on the floor. The machine was damaged in the incident. “Vote for change, vote without fear," YSR Congress chief Jagan Mohan Reddy told NDTV. Reddy has been attacking Chief Minister Chandrababu Naidu for not fulling his election promises from 2014. "I'm very confident, people are looking for a change, vote without fear," he added. Andhra Pradesh BJP state president Kanna Lakshminarayana has cast his vote in Guntur. Jana Sena Party candidate Madhusudan Gupta has been arrested for damaging an EVM at a polling booth in Gutti town in Anantapur district. 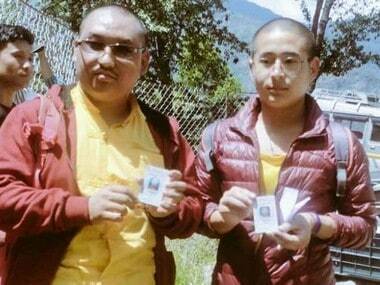 He was protesting against the alleged partisan manner in which polling officials were conducting duties. Andhra Pradesh chief minister N Chandrababu Naidu and his family cast their votes in Amaravati. An hour into voting, polling has yet to start at a booth at Gujarati Mandal School in Vijayawada, according to The Times of India. YSR Congress Party chief Jagan Mohan Reddy cast his vote at the Pulivendula constituency. The contest for the post of Chief Miniser of Andhra Pradesh is between TDP chief N Chandrababu Naidu and YSR Congress Party’s Jagan Mohan Reddy. EVMs in booth no 153 in Raptadu Assembly constituency in Anantapur district failed to work, The Hindu reported. EVMs in polling booth no 101 in Visakhapatnam East constituency was also not working, according to the report. In the 2014 Assembly election, TDP had won by a margin of just 0.2 percentage points. TDP won a vote share of 44.6 percent and YSR Congress got 44.4 percent of the votes. In the 2014 Assembly election, TDP won 101 seats, YSRCP 68, BJP four, Navodayam Party 1 and an Independent candidate won one seat. The Congress didn't bag any. Voting will begin at 7 am and end at 6 pm. But in the seats affected by Left-Wing Extremism, mostly those bordering Odisha and Chhattisgarh, polling will end at 4 pm. Voters standing in queue at polling booths at 6 pm will be allowed to cast their votes past the closing time. Over 3.5 crore voters — 1,94,62,339 men, 1,98,79,421 women, 3,957 transgenders and 10.15 lakh first-time voters — will vote in 175 Assembly constituencies. The state has 56,908 service voters, while 5,323 NRIs from the state are also registered as voters. Chief Minister N Chandrababu Naidu is seeking re-election for the ninth time from Kuppam constituency in Chittoor district. His son Nara Lokesh is making his electoral debut from Mangalagiri. This will be the first time in its 37-year history that TDP is contesting without any allies. As many as 2,118 candidates are in the fray for the Assembly election. Apart from Chief Minister Chandrababu Naidu’s Telugu Desam Party (TDP), the YSR Congress Party, Congress, BJP and Jana Sena are also contesting. This is the first time since Telangana was carved out of the state that Andhra Pradesh will vote in Assembly elections on Thursday, 11 April. The election will be held simultaneously with the first phase of the Lok Sabha polls. 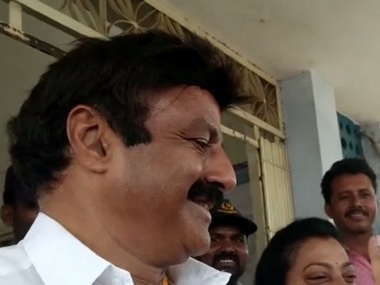 Actor and TDP Assembly candidate from Hindupur, Nandamuri Balakrishna, cast his vote along with his wife Vasundhara. TDP minister Akhila Priya Bhuma, whose husband Bhargab and sister Mounika, were injured in a violent clash between TDP and YSRCP workers in Ahobilam, is seeking re-election from Allagadda Assembly constituency. YSRCP candidate Gangula Pratap Reddy switched loyalties between TDP and YSRCP in the last couple of years. Both Bhuma and Gangula are influential in Allagadda, notorious for party violence. Andhra Pradesh IT minister and TDP leader Nara Lokesh said: "It'll be a decisive win in Mangalgiri and also across the state. I am here to convince my electorate that I am a meaningful and a worthy candidate, and I think I've done that. Nara Lokesh is contesting the Assembly election from Mangalgiri constituency. Andhra Pradesh Assembly Election 2019 Voting LATEST Updates: Voter turnout was 55 percent in Andhra Pradesh till 3 pm amid clashes between TDP and YSRCP, ANI reported. The family of the late Nandyal MLA Bhuma Nagi Reddy have accused YSRCP leaders in Allagadda constituency of kidnapping their supporters. Bhuma Mounika (sister of state tourism minister Bhuma Akhila Priya) and Jagath Vikyath Reddy (brother of Akhila) claimed they would protest in front of the YSRCP leader’s house if their supporters aren't returned. Bhuma Mounika also accused YSRCP workers of destroying her car by throwing stones. After YSRCP chief Jagan Mohan Reddy alleged that Chief Minister Chandrababu Naidu had threatened the Election Commission, TDP released a video of Naidu's meeting with Chief Electoral Officer Gopalkrishna Dwivedi, in which he lodged a protest claiming that the poll panel was biased towards YSRCP. Speaker of the Andhra Pradesh Legislative Assembly Kodela Sivaprasad Rao was allegedly attacked by YSRCP workers in Guntur district’s Inumella village in Sattenapalle Assembly constituency, after which he fainted. He was there to inspect a booth. Rao is contesting from the Narasaraopet Assembly seat. TDP leader Bhaskar Reddy and YSRCP worker Pulla Reddy died in clashes between party cadres at the polling station in Tadipatri Mandal's Veerapuram village, Anantapur district. Two other party workers are believed to be in a critical condition. YSRCP workers allegedly attacked Speaker of the Andhra Pradesh Assembly Kodela Siva Prasada Rao, who had gone to inspect a polling booth in Guntur's Inumella village in Sattenapalle Assembly constituency. In the same district, YSRCP candidate G Srinivas Reddy from Narasaraopet Assembly constituency was injured after his car was allegedly attacked by TDP workers in Yallamanda village. Chief Electoral Officer Gopalakrishna Dwivedi has denied reports on 30 percent of the EVMs in Andhra Pradesh malfunctioning. "In total, we have 45,959 booths, and we are using around 92,000 EVMs. We got 344 issues and 25 are still pending," he said. Malfunctioning EVMs across the state resulted in a low voter turnout of 10.62 percent till 9 am in Andhra Pradesh. TDP workers were caught on camera thrashing a YSR Congress Party agent at a polling station at Puthalapattu in Chittoor district. Meanwhile, in a video, a TDP councillor Shivashankar Yadav can be seen distributing money to voters at Nandamurinagar polling station in Kurnool. The constituency falls in one of Andhra Pradesh's Maoist-affected districts. Chandrababu Naidu has written to the Chief Electoral Officer, saying 30 percent of the EVMs were not functioning till 10 am, according to the reports he had received. Demanding re-polling, he claimed that in some polling stations, votes for TDP were being recorded for YSR Congress. 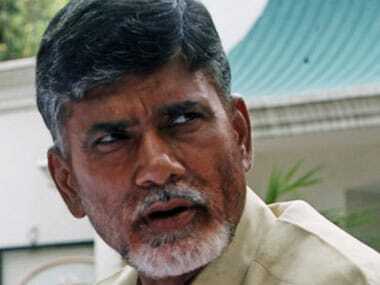 Clashes between TDP and YSRCP party workers are being reported from various places of Andhra Pradesh. Polling equipment was destroyed in Srinivasapuram village in Guntur's Gurazala mandal; in Jammalamadugu, a YSR Congress worker was injured, people were injured in a stone-pelting incident in Ponnathota; similar news is coming in from Mydukur constituency. Andhra Pradesh chief minister Chandrababu Naidu has demanded repolling at the locations where EVMs did not work. He said 30 percent of the voting machines had malfunctioned, because of which polling started nearly three hours late at many places. Jana Sena chief Pawan Kalyan defended his party leader ​Madhusudan Gupta, who was arrested for damaging a voting machine in Gutti in Guntakal Assembly constituency. "How do we know who broke the machine?" he said, even though there's a video of Gupta throwing an EVM on the floor at the polling booth. Andhra Pradesh Chief Election Officer Gopala Krishna Dwivedi was unable to cast his vote at Tadepalli Assembly constituency in Guntur district due to malfunctioning EVMs. TDP candidate Aravinda Babu was attacked allegedly by YSR Congress activists in Narsaraopet Assembly constituency. The police had to lathicharge workers of both parties to quell the clashes. So far, 36 Assembly constituencies in Andhra Pradesh have reported EVM glitches. Several booths in Chandrababu Naidu’s Kuppam constituency also reported malfunctioning EVMs. Voting has been delayed at a number of polling booths in Andhra Pradesh due to malfunctioning EVMs. Chandrababu Naidu has reiterated his demand to have the voting machines with paper ballots. Jana Sena Party candidate Madhusudan Gupta has been arrested for damaging an EVM at Guntakal constituency in Anantapur district's Gutti town. The police said Gupta was angry with the polling staff for not displaying the names of the Assembly and parliamentary constituencies properly, after which he lifted the EVM and threw it on the floor. YSR Congress Party chief Jagan Mohan Reddy cast his vote at the Pulivendula constituency. In Amaravati, Andhra Pradesh chief minister N Chandrababu Naidu and his family cast their votes. Of the 46,120 polling stations, 8,514 have been classified as critical and 520 as affected by Left-Wing Extremism. On the eve of polling day, 197 companies of Central Armed Police Forces were deployed across Andhra Pradesh, in addition to 51,525 state police personnel, 60 companies of Andhra Pradesh Special Police, 4,500 Karnataka and 736 Odisha police for security will be deployed. Voting will begin at 7 am, with Chief Minister N Chandrababu Naidu seeking re-election for the ninth time from Kuppam constituency in Chittoor district. His son Nara Lokesh is making his electoral debut from Mangalagiri. As many as 2,118 candidates are in the fray for the Assembly election. Apart from Naidu’s Telugu Desam Party (TDP), the YSR Congress Party, Congress, BJP and Jana Sena are also contesting. Additionally, this will be the first time in its 37-year history that TDP is contesting without any allies. Polling will end at 4 pm in the seats affected by Left-Wing Extremism, mostly those bordering Odisha and Chhattisgarh. Authorities are using 2,684 GIS and GPS-fitted vehicles and personnel tracking devices, 67 drones and 1,200 body-worn cameras for surveillance and security monitoring. In the 2014 Assembly election, TDP won 101 seats, YSRCP 68, BJP four, Navodayam Party 1 and an Independent candidate won one seat.